Performing Arts: J'nai Bridges at the Kennedy Center Review: The mezzo-soprano unleashes the full breadth of her vocal prowess. Review: An intimate setting showcases full breadth of Bridges’ vocal prowess. Mezzo-soprano J’nai Bridges, the 2012 Marian Anderson Award recipient, performed a program of songs by Debussy, Berg and Montsalvage, rounded out by John Carter’s Cantata in a full recital presented recently at The Kennedy Center. The Terrace Theater was an ideal setting, almost reminiscent of a parlor concert for intimate friends. 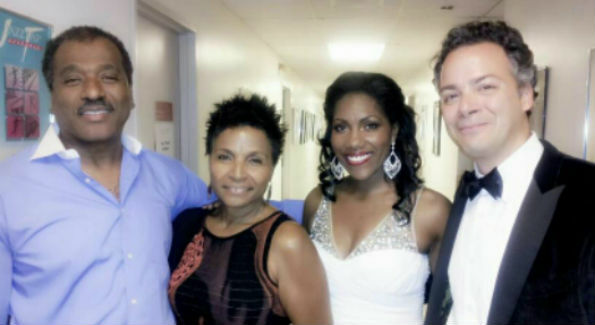 In addition to the regular attendees of the Millennium Stage concerts, the audience included a strong representation of Bridges’ supporters, including her family who came from around the country to support this important debut. Though Bridges has performed several times at the center as a part of the Conservatory Project, this was her first full recital. In the French songs of Debussy, Bridges opened confidently with a rich resonant sound surrounded by a dramatic depth, even when she was not singing. Occasionally, the contrasting dynamics in the vocal line became a distraction rather than an accentuation. Pianist Bradley Moore was a supportive accompanist throughout, playing with a sense of anticipation and uniformity with Bridges in each musical idea. The German songs of Alban Berg proved to be the calling card of the evening. “Nacht” was a technical wonder, with Bridges negotiating the intervals with finesse. It was also the ideal vehicle in which to showcase her ability to sing pianissimi exquisitely and with control. Although the songs were sung seamlessly in a set, it was amazing to watch Bridges give life to each distinct idea with her gestures and facial expressions. Three songs by Montsalvage proved to be a welcome stylistic contrast to the beginning of the recital. Rhythmic and flavorful, these Spanish songs were beautifully sung. The Cantata by John Carter ended the recital. Born in St. Louis, Missouri, Carter served as composer-in-residence of the National Symphony Orchestra in 1968. In recent years, the song cycle based on the themes of well-known spirituals has become frequently performed in recital and in 2007, a live recording of the work in London’s Wigmore Hall was released by soprano Christine Brewer. Bridges dedicated the performance of Carter’s work to Marian Anderson. “She made so much history here,” Bridges said from the stage. Each movement is an instrumental one partnered with a spiritual theme. Perhaps the best known, “Toccata” is a thrilling treatment of the spiritual “Ride On King Jesus.” Bridges unleashed the full glorious power of her voice as it crested above Moore’s dazzling keyboard. The last phrase, which exclaims “No man can-a hinder me,” captured the spirit of the program. Though the great Marian Anderson experienced much adversity, the essence of her journey was the vehicle for this very occasion. Notably in attendance was the Metropolitan Opera soprano Carmen Balthrop, former Director of Artistic Operations for Washington National Opera Christina Scheppelmann and founder of the Marian Anderson Historical Foundation, Blanche Burton Lyles, the first African-American woman to graduate with a degree in music from the Curtis Institute of Music.